The date and time at which this transaction occurred. The type of payment that was made--credit card, check, cash, etc. The type of credit card used to make a credit card transaction. The "stub" that we receive from the credit card processing gateway. Since it would be a security risk for us to possess full credit card numbers, we only have access to the first four and last four digits of the card number, as displayed here. If entering credit card donations processed outside Salsa, we strongly recommend for security purposes that you likewise do not record full 16-digit card numbers here. The expiration date of the credit card used in the transaction. A reference number, issued by the credit card processing gateway. In communications with your merchant account about a particular donation, you will want to have the PNREF number available. A code returned by the processing gateway, indicating a successful donation, or a failure of a specific type. This Response Message shows if the transaction was approved or failed. The Address Verification System (AVS) is a system used to verify the identity of the person claiming to own the credit card. The system will check the billing address of the credit card provided by the user with the address on file at the credit card company. If this is a donation made through a storefront, this field contains the information about the order (items, sizes, etc). The tracking code, if any, attached to this donation. This is one of several secondary tracking fields available to populate additional gift information that organizations, especially those entering offline contributions, have available. It's easily confused with the field above, "Tracking Code," but the two are not the same -- and donation page tools that populate tracking codes (such as "Default Tracking Code" on a page, or &track= appended to a url) populate "Tracking Code" and not "Donation Tracking Code". The tax status of the entity to which this donation was made (for online donations, this is a setting available on the donation page). The URL or filename source of the donation record. The key of the merchant account that this donation was made through. The type of transaction -- event fees, donations, membership fees, etc. The status indicates order fulfillment for storefront transactions, or event fees in the case of an event transaction. Any additional information or instructions attached to the donation record. If related to an event fee that was created in Salsa, the user will be connected to that particular event fee. Your provider MUST refund this donation, unless you run your own merchant gateway. Just pressing this button will NOT refund the money back to the supporter. Please contact us to refund this donation, or if you have any questions concerning the process. The donation detail view you are looking at shows one specific donation. If that donation took place as one instance of a longer-term recurring donation, details about the "parent" recurring gift will be shown here. If the recurring gift is affiliated with a specific chapter, the chapter_key (its unique number) will be listed here. The unique identification number in Salsa of the supporter who made the recurring gift. The unique identification number of the recurring gift itself. For an organization using its own merchant account, this is the unique identification number of the specific merchant account where the recurring gift was directed. This will be of most interest to organizations with multiple merchant accounts. A timestamp for the last recorded change (of any kind) to the recurring donation record. The timestamp created at the moment the gift was originally created – i.e., the moment the donor pressed "submit" initially authorizing the recurring gift. A reference number, issued by the credit card processing gateway. In communications with your merchant account about a particular recurring donation, you will want to have the RPREF number available. A reference number, issued by the credit card processing gateway. In communications with your merchant account about a particular recurring donation, you will want to have the TRXPNREF number available. ID number that is assigned to the recurring donation by the merchant processor. The amount of the recurring donation per instance (e.g., $10 monthly and $10 quarterly will both be shown as 10). The date of the first instance of the recurring gift. Typically, this will be the day of or the day after the date indicated in the recurring gift's "Transaction Date" field. Indicates whether the gift is automatically re-charged every month, quarter, six months, or one year. Indicates how many times a recurring donation will occur starting at 1 month and going up to unlimited. This links the donation to a particular chapter, if applicable. In Honor Of & Misc. If "In Honor Of" information is associated with the gift, it will be listed in these fields. This is an identity number on the supporter table that may have been assigned in a prior database. This is a miscellaneous field that is available for the account manager's use and most commonly used in uploads. 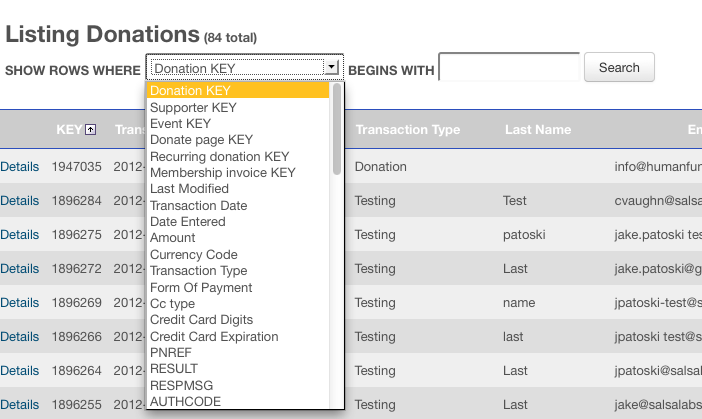 Although this is simply an arbitrary text field that could be used for any type of coding an organization might desire, a donation "batch" typically refers to a collection of donations – such as all the donations for a particular date – and is sometimes used for accounting or audit trail purposes. These are miscellaneous fields available for any additional gift data. They are most commonly used in uploads.